The Big Idea: Big Bird's the perfect bird to teach kids (and grown-ups too!) how to use the important coping strategy of imagining their own safe place inside. Trauma is a big deal…but Big Bird’s got a big spirit, a big heart, and big dreams. I’m listening to you. You matter. What you say, feel, and think is important to me. Let me help you put some words to your feelings. Sometimes problems are too big to handle yourself. It’s smart to ask for help. Let’s find a way to help you do or think about things you love. I’m interested in you and what’s happening inside you. There are other adults who care for you, too. It’s great to share a special time together. In order to begin to heal, kids need to feel protected and safe. Kids can create a safe place, either physically or in their imaginations, to cope with their feelings. Share this story, in which Big Bird creates his own imaginary safe place. Pause the storybook to talk about what kids see and hear. Afterward, ask kids what their safe place might look like. 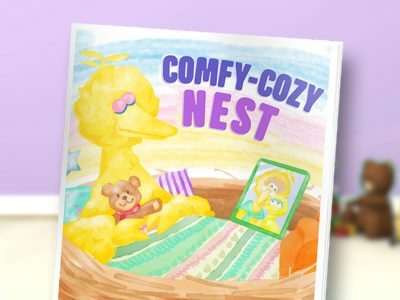 When Big Bird has big feelings, he creates a safe place in his imagination, a big nest filled with all his favorite things, like birdseed cookies and a picture of Granny Bird. 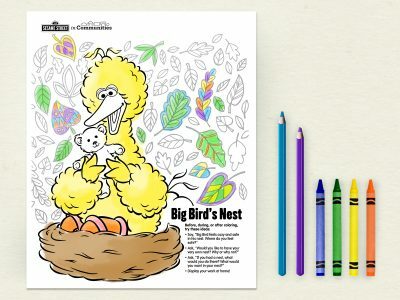 With this interactive activity, kids can explore the concept of a safe place by helping Big Bird decorate his safe place. You might use this tool when kids need calming down, or any time at all. 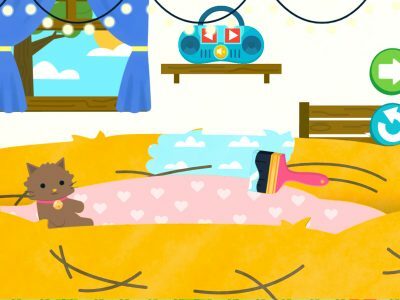 First, use the video to introduce the idea of a safe place—a place you can go in your imagination to feel safe and calm (all kids and adults can benefit from this strategy)! Help kids play the game. Afterward, ask, “What were some things you helped Big Bird do?” Do they remember any parts of Big Bird’s strategy? The more they play, and the more they watch the video and read the storybook, the more likely they are to remember the strategy later, when they might need it. After trauma, when our brains can be “hijacked” by fear, anxiety, or anger, a wordless activity like coloring can help us get “unstuck.” Coloring can reduce stress in both adults and kids, and this adult-child coloring page lets you sit quietly with kids and just be together. We can have a good time together. We can make something beautiful, even when the world around us feels ugly. Kids can use crayons or markers. Colored pencils or thin-tipped markers work well for the detailed “adult” areas, but crayons will work too! Sit side by side in a quiet space with a surface. You might put on music that you both like. Kids color Big Bird and his nest, grown-ups color the more detailed background. Remember there’s no right or wrong way to color; the goal is to sit and relax together. It’s okay to sit without talking, too! Praise your child’s efforts and display the completed page in your home.